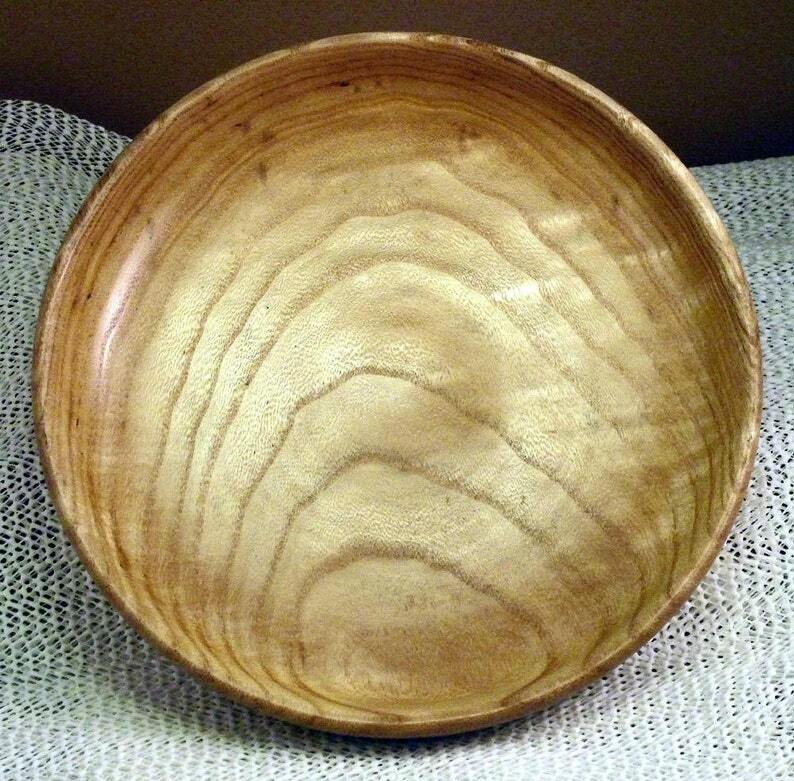 This is a shallow bowl/dish made from a very pretty piece of wood. It's called Royal Pawlonia and this piece has some very nice figure and grain. It measures 7-3/8" in diameter, 1-1/2" tall and just over 1" deep. It was finished with several coats of Danish Oil and a coat of carnauba wax. The finish is food safe but is not recommended for liquids and it is not microwave or dishwasher safe. I ship anywhere, but buyers outside the USA as well as those purchasing multiple items please contact me prior to purchase so that I can calculate the correct shipping charge and change the listing as necessary. If, by chance extra shipping costs are paid I will refund the overage promptly. Thank you for looking and please come back again. 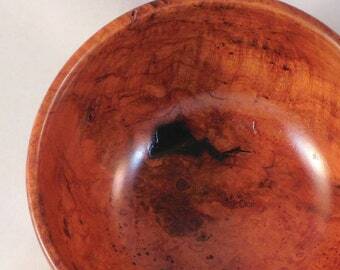 The hand-turned cherry wood bowl is perfect. Expertly crafted, including a good eye for bringing out the striking grain patterns. Pas pratique le système par rotation. Due to a stock issue, the seller very generously offered me my choice of a refund or pen substitution; I chose the latter, received a beautiful specimen in its place, and note that Mr. Clinton and MLC Woodworks are an utter pleasure to work with, and really take of their customers. Great pens...great customer service. I accept payments from PayPal(preferred) and money orders. Items will ship when payment is received. If PayPal is selected as payment method, payment must be received within 4 days from the date of purchase. If not, the purchase will be canceled and the item will be re-listed. If you are sending a money order it must be received within 10 days or the same policy applies. All items are warranted from defects in workmanship and function for 120 days from date of purchase. Please contact me as soon as a problem is encountered. I will do what is necessary to alleviate the problem up to and including replacement of the item. Old item must be returned to receive replacement. I prefer to ship via USPS Priority Mail Insured. If you prefer another method, please let me know at time of purchase. If the item is larger, I may choose another method such as UPS Ground. If you need a rush shipment let me know at the time of purchase. Shipping costs will increase accordingly for rush shipments. I do accept purchases from outside the USA but shipping charges and time will be accordingly higher than domestic rates. Please contact me prior to purchase to enable me to calculate the correct shipping charge. Feel free to contact me if you have a question about my work or about something you want. I'll try to make most anything, but, to quote Dirty Harry Callahan, "A man's got to know his limitations". There are some things I can't do due to physical problems. I hope I'll be able to keep doing what I'm doing now and keep learning more for a long time.